Description: Castilleja chromosa/angustifolia has bristly gray-green to purple-red herbage. What looks to be flowers are actually the colourful red-orange bracts that hide the tubular yellow-green flowers that have a thin coat of white hairs. Leaf: The 20–70 mm linear/lance-shaped leaves are lower down the stem from the colourful bracts and are comprised of 3 or 5 narrow fingerlike lobes. 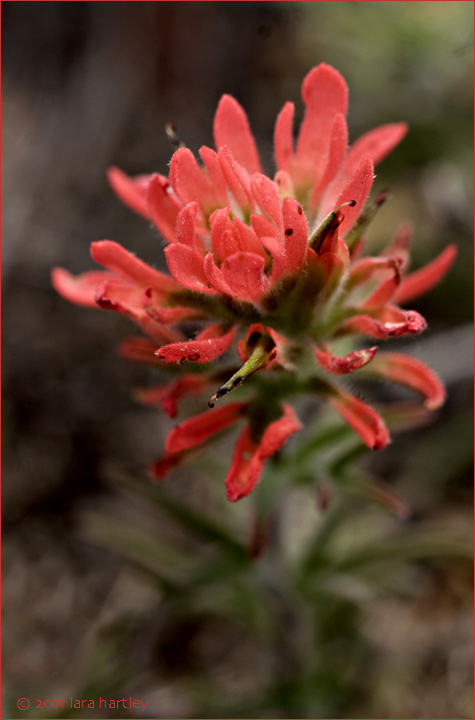 Notes: This Desert Indian Paintbrush is not limited to the desert alone, often growing well above the desert and sage landscapes into pinyon/juniper woodlands. It is partially parasitic on the roots of other plants. Castilleja chromosa/angustifolia, a dicot, is a perennial herb that is native to California and is also found outside of California, but is confined to western North America. 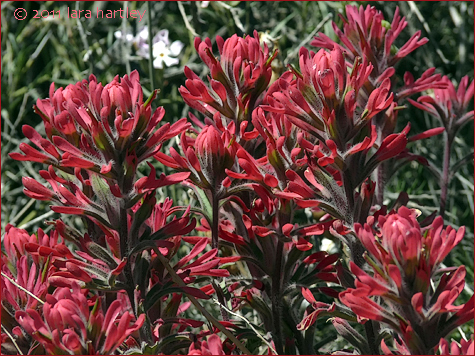 There are more than 30 species of Castilleja in California. Distribution outside California: to Oregon, Montana, Wyoming, Colorado, New Mexico. This plant was photographed in the San Bernardino Mountains near Cactus Flats with a Canon EOS 30D and 100mm macro lens.